Landlady at O’Leaver’s, Feb. 10, 2017. Friday night’s Landlady show will likely go down as my first top-5 music moment of 2017. Fronted by Adam Schatz a.k.a. Brown Sugar of the band Man Man, the five-piece played a striking set of proggy indie rock that recalled Schatz’s other band and, for me any ways, acts like Les Savy Fav and Head of Femur. Landlady’s sound is inventive without being disjointed, melodic but sonically adventurous. And there’s nothing quite like Schatz’ voice, a high, cooing nasal delivery that bounces and jumps along with the acidic, almost afrobeat-style rhythms. Drummer Ian Chang is one of the best stickmen I’ve seen under O’Leaver’s record collection, a marvel of poly-rhythms, he kept the sound boiling as Schatz and company rifled through a set of tunes off the bands’ last couple of albums. Highlights were a raging version of standout tracks “Electric Abdomen” and “Driving in California,” both off stellar new album The World Is a Loud Place (Hometapes, 2017). 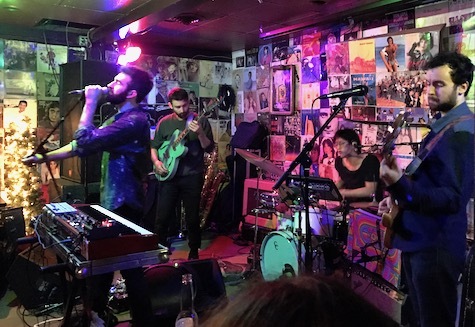 At set’s end, Schatz brought up a small horn section, who stayed for the epic closer, a 10-plus-minute performance of “Above My Ground” where-in Schatz climbed above the crowd, leading them in a chorus of “Always, always, always…” that built to a climatic release. Well, you can see and hear for yourself in the following clip recorded from my phone for Facebook Live. I’m told this was one of first times that opening act Thick Paint has performed as a full-blown band. 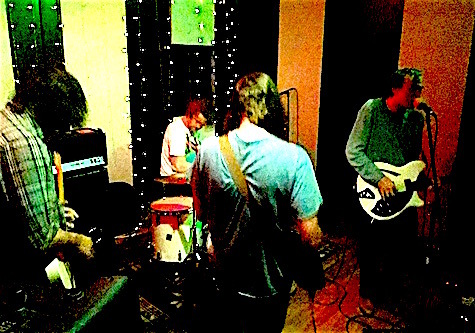 Joining Graham Patrick Ulicny was a second guitarist, Icky Blossoms’ Sarah Boehling on bass, and two drummers. Thick Paint at O’Leaver’s, Feb. 10, 2017. The product was proggy goodness reminiscent of early Talking Heads. Like Schatz, Ulicny has a unique, high-end voice like no one else around here. The only set-back was that the band only played four songs because they’re so new together. We all want more, Mr. Ulicny. More about the above video: I am, again, pleasantly surprised at the audio quality one can capture from a handheld iPhone 7. I figured the mics would be blown out, but this doesn’t sound bad at all. I had someone tell me I should do these iPhone recordings at every show. I don’t for a number of reasons, the first being it’s probably illegal, at least without the band’s permission. Second is that it’s got to be rather annoying for the band to see some guy holding a camera while they’re playing. And third, I’d rather just enjoy the music. Still, if I can sneak one song onto Facebook Live by bands that I know won’t mind, I will. Follow me at facebook.com/mcmahan. Arbor Labor Union at Milk Run May 28, 2016. Word went out over the weekend that Milk Run is leaving its current location at 1907 Leavenworth. In fact, this weekend’s shows were the last at that specific venue, which hosted its first show Nov. 6, 2015. Sam Parker, one of the founders of Milk Run, confirmed the rumor, saying the all-ages performance space will move to a new location with cheaper rent. Tried as I might, I could not pry the new location out of Parker. He said the owners will make an announcement this week “when they’re ready.” He did say the new space will be “roughly the same size” as the old Milk Run space. He also said expect the same sort of progressive, indie-flavored bookings.